At Sunshine Coast Shade Sails, we have recently been expanding our range of products and services, and we now offer cantilever shade structures (also known as counter lever shade structures) across the Sunshine Coast region. Providing shade cover while allowing for plenty of light, cantilever shade structures are perfect for protection against the Australian sun all year round. By utilising side posts cantilever shade structures provide maximum use of the space beneath the canopy, allowing for more flexibility in terms of accessibility to walkways, car spaces, dining areas and play areas than a typical shade sail installation. Professionally installed and offering a wide array of design options, cantilever shade structures from Sunshine Coast Shade Sails are versatile and durable. 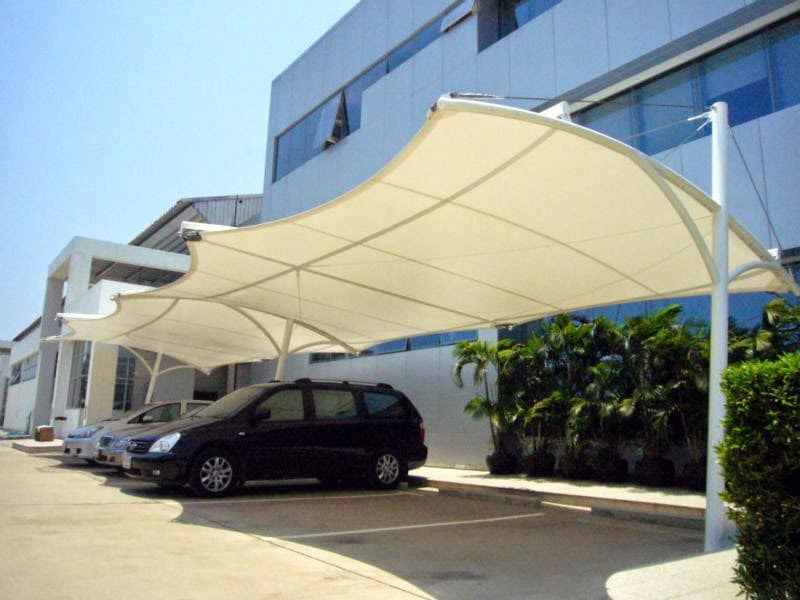 Cantilever shade structures are an ideal shade solution for providing maximum sun and weather protection without the worry of obstructing thoroughfares. As an excellent alternative to standard shade sail options, cantilever shade structures can be installed with a single post allowing for a functional and open outdoor space with plenty of room for using the area underneath. If additional shade posts are necessary, they are installed to just one side of the structure and are kept to a minimum, creating a visually appealing solution while having little impact on space availability. 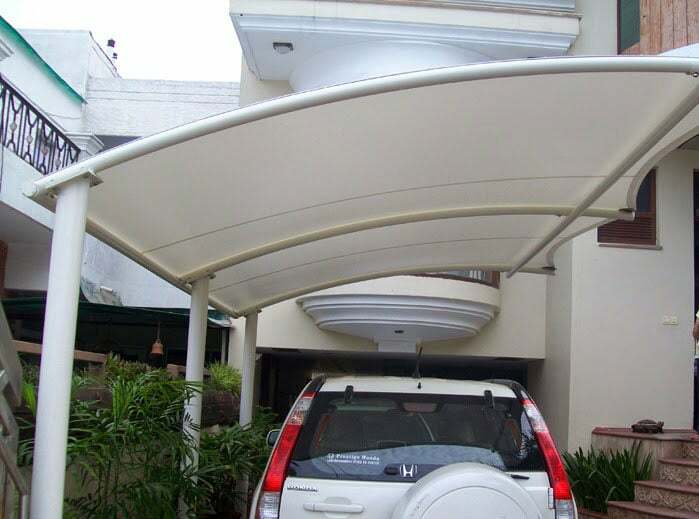 So you can use the space to set up an outdoor dining or entertainment area or park your car without the fear of scratching your vehicle against shade posts! Perfect for commercial parking areas, our structures are ideal for protecting cars from sun damage while keeping vehicles cool while the occupants are shopping or dining. 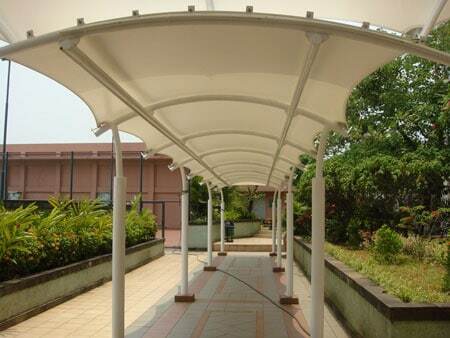 Attractive in design, our cantilever shade structures are tailored to your needs and requirements. Offering a range of colour and fabric options, the structure can easily fit with the colour scheme and design of your home or commercial space. If you are looking for a shade solution that doesn’t require posts to be installed at each corner, cantilever shade structures are the answer. Requiring minimal posts while being capable of spanning large areas, cantilever structures are ideal for a large selection of domestic and commercial situations. Whether you are looking for a shade solution for your home carport, commercial carpark, patio, alfresco dining area, shopfront or swimming pool, our cantilever shade structures are versatile enough to meet your needs. Please call us today on 1800 300 319 or contact us online, we are happy to supply extra details and provide you with an affordable quote.